Keep your existing audience engaged with clear, informative communication. Halo Designs can help you stay connected to your audience with newsletters, annual reports, electronic media and more. Scroll down or click on an image to see more. 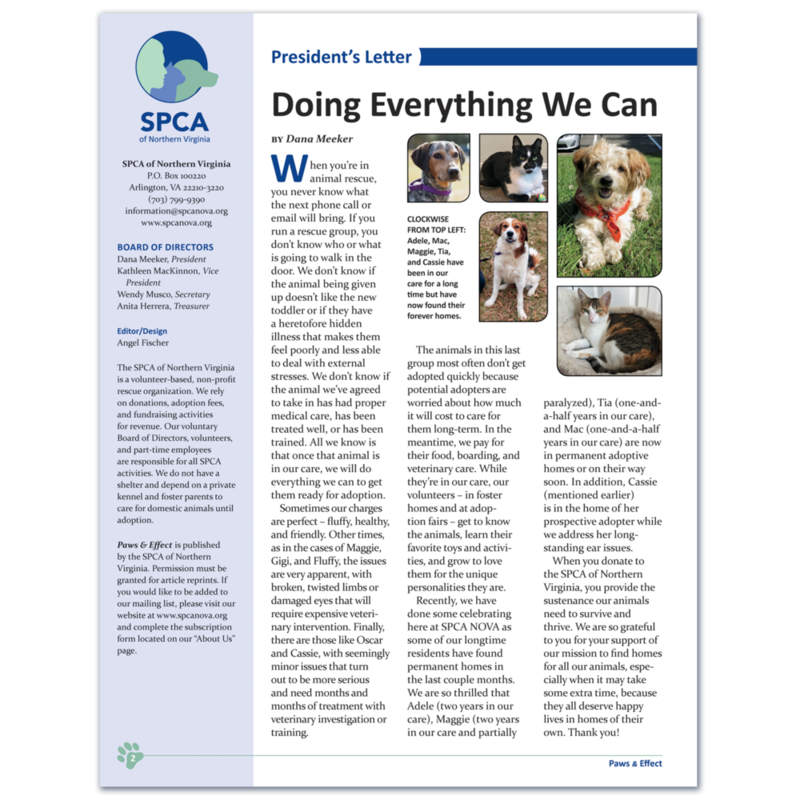 In 2013, the SPCA of Northern Virginia (SPCA NOVA) hired me to redesign and edit its 12-page newsletter. I styled it to coordinate with its existing website. 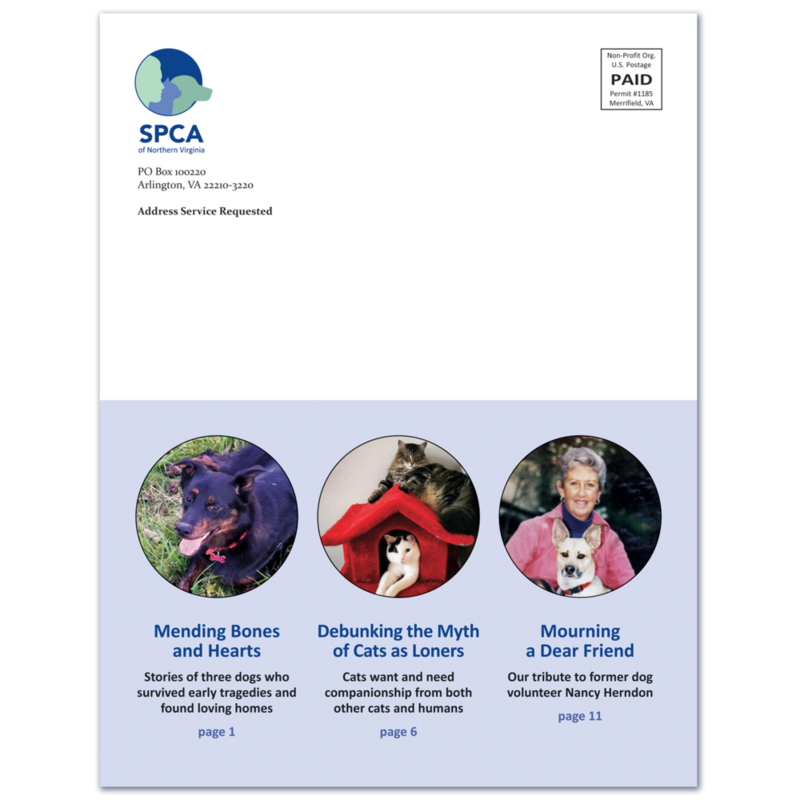 In 2017, SPCA NOVA hired me to redesign its logo, which meant a fresh look for its newsletter was needed as well. 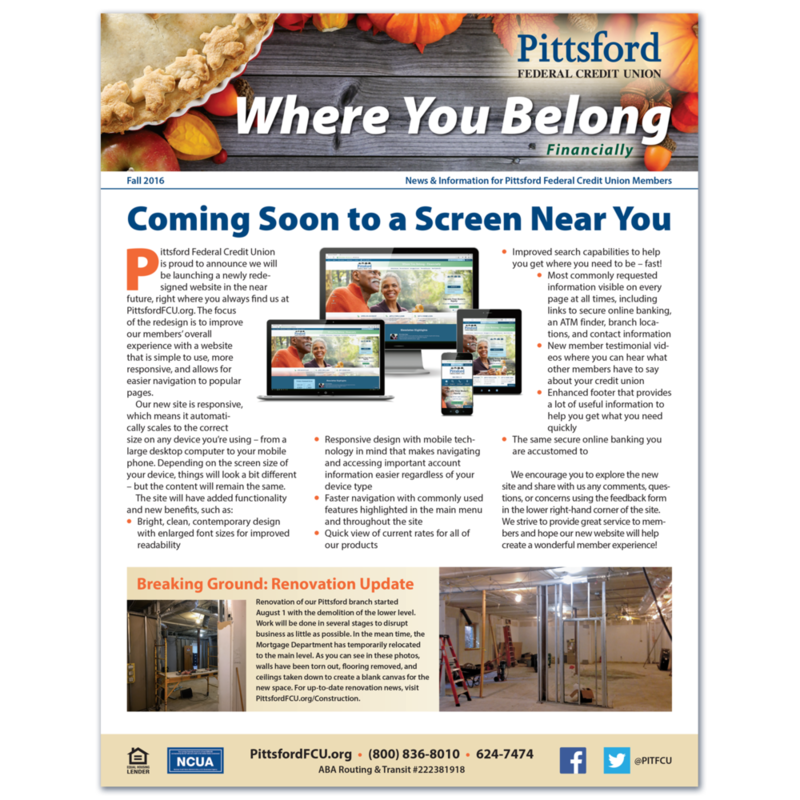 One of the ways Pittsford Federal Credit Union in Pittsford, N.Y., stays connected with its members is with a quarterly newsletter. I design each newsletter as well as edit the content, and I have even used some of my own photography for the cover art (the balloons and lilacs seen here). I took over production of the newsletter in 2008, implementing a modest redesign at that time. In 2013, I recommended another redesign to bring it in line with the style of other marketing materials. 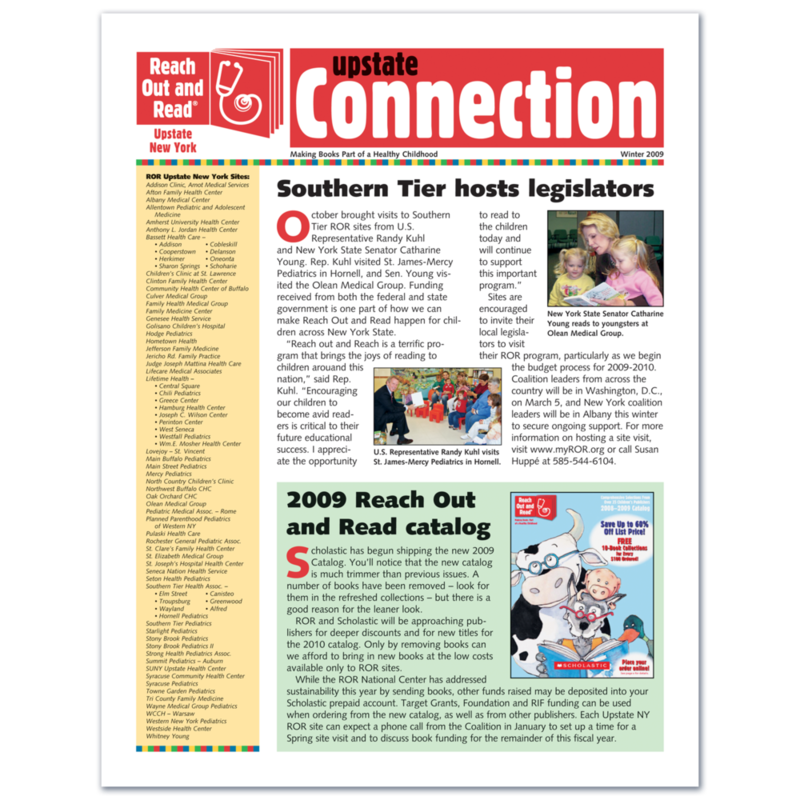 Even though Reach Out and Read (ROR) of Upstate New York was printing its newsletter in full color, it wasn’t taking full advantage of it. In my redesign, I infused it with color and suggested a new name. I used the national Reach Out and Read’s style guide to choose colors, fonts and design elements that fit in well with the national identity and reflect the organization’s focus on children. 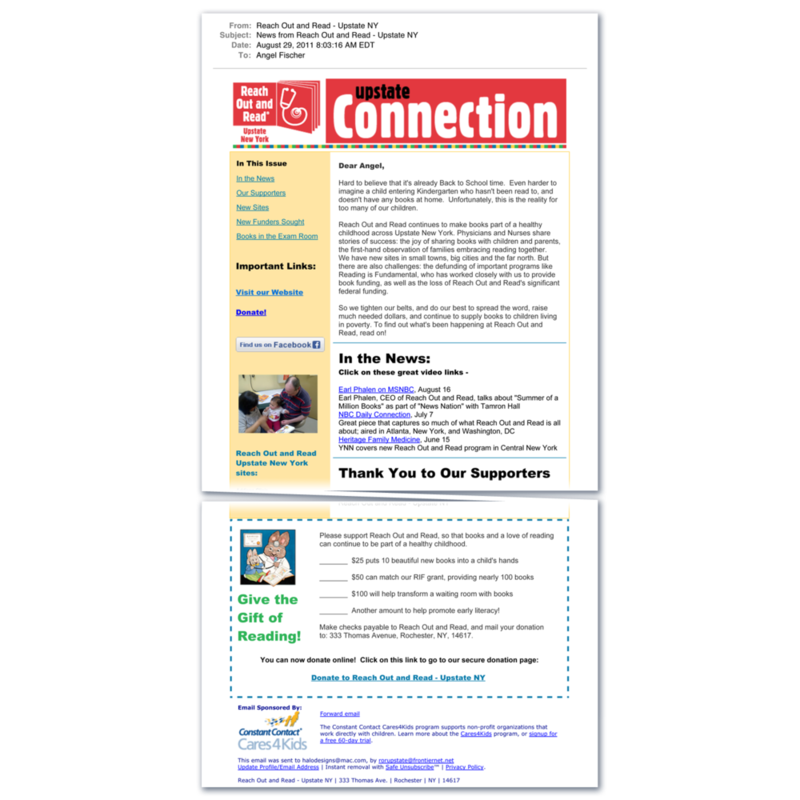 In 2011, ROR of Upstate New York decided to start publishing its newsletter electronically to save money and be more eco-friendly, so I set up a template in its Constant Contact account to mirror the original print version of the newsletter. 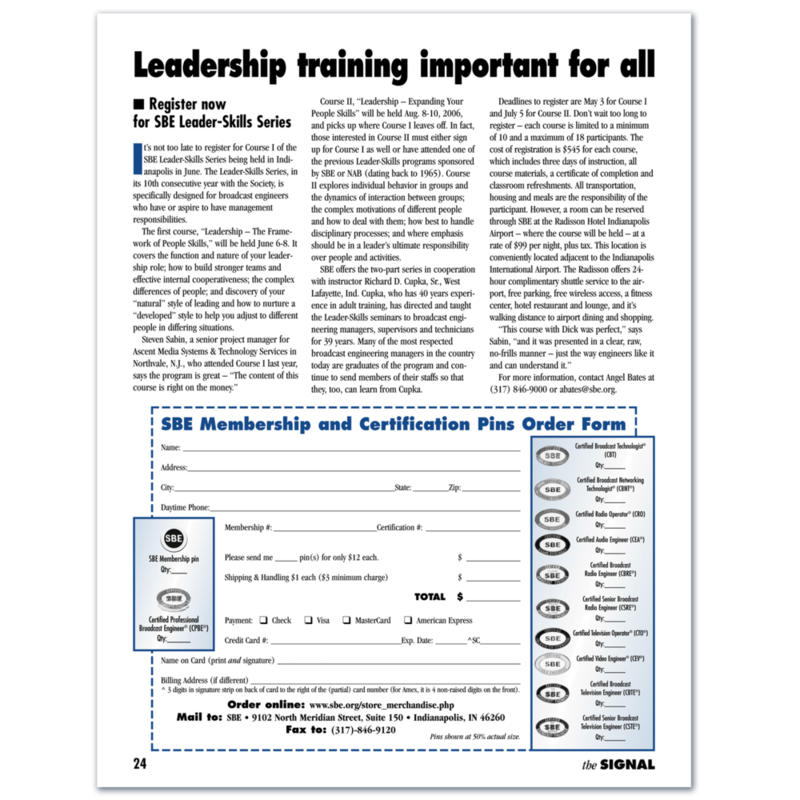 SCOR!, a non-profit organization in Rochester, N.Y., wanted to give its newsletter a new look without breaking the bank, so it chose the up-front costs of purchasing Adobe InDesign and commissioning me to create a template it could use on its own. I also suggested giving the newsletter the name Inspirations, based on SCOR! 's “Be Inspired” tagline, to give the newsletter a clear identity. Westfield Washington Schools in Westfield, Ind., hired me to create a combination annual report/calendar. The school chose the theme each year and provided me with a collection of photos taken the previous year. I tailored each year's design to reflect its theme and chose which photos to use. I used empty calendar blocks to feature local advertisements, many of which I also designed. I color-coded the school district map and assigned each school a specific icon that I used in the calendar to identify events by school participation. 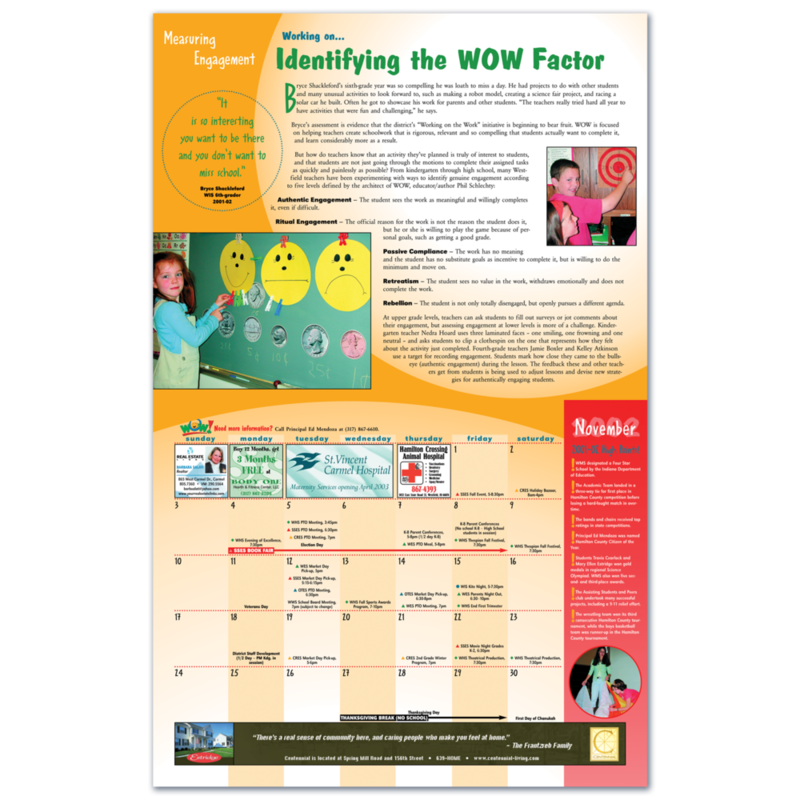 This allowed parents to easily find what activities applied to them and their children. 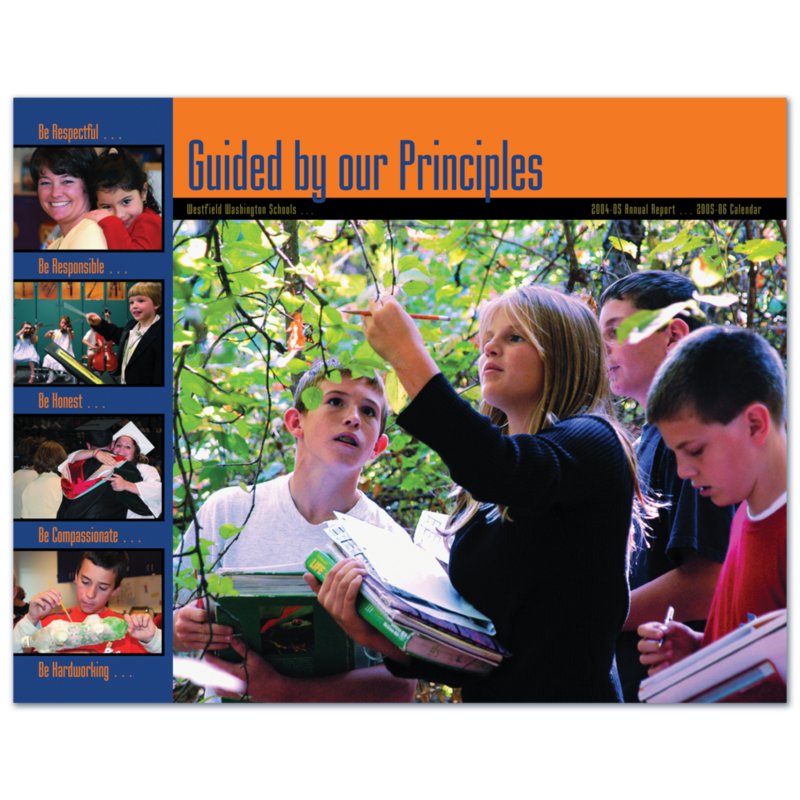 The 2002 annual report received an Award of Excellence from the National School Public Relations Association. I worked for the Society of Broadcast Engineers (SBE) in Indianapolis for nearly seven years. 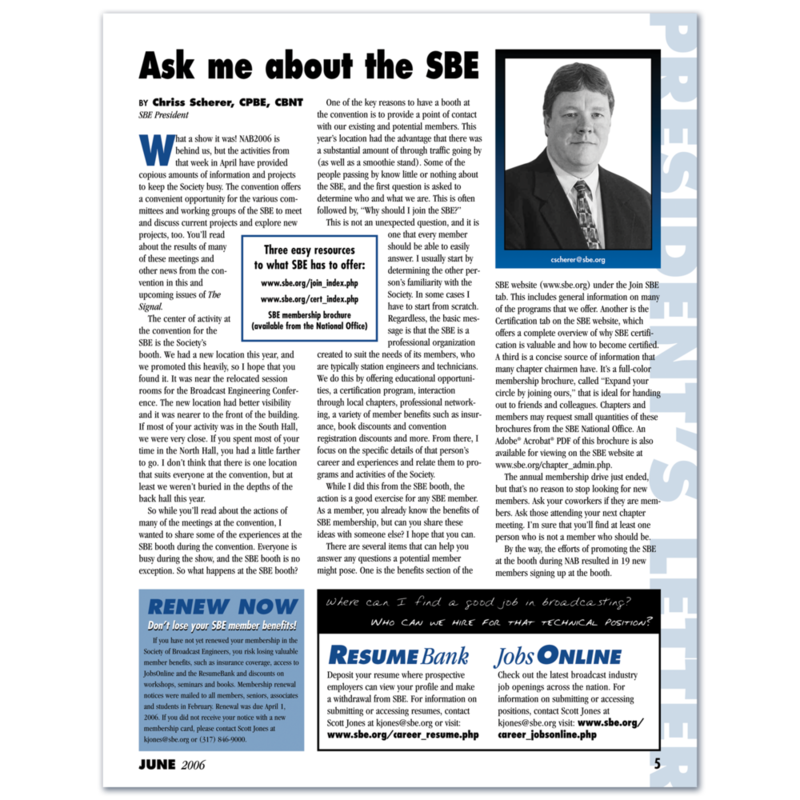 One of my most fulfilling roles at SBE was editor of its newsletter. 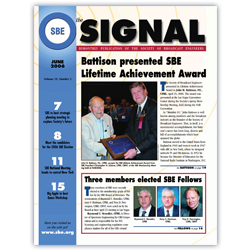 When I started working for SBE in 1999, The Signal was a two-color quarterly newsletter. By the time I left, it was being printed bimonthly with several pages in full color. Not only did I serve as editor for the newsletter, but I was also responsible for all graphic design, event photography, advertising sales and some writing. In 2003, The Signal was named Indiana’s Best Association-Published Newsletter by the Indiana Society of Association Executives. My employment with SBE ended in the summer of 2006 when I got married and moved out of state (the nature of the job required a full-time person at the SBE national office). However, when an emergency arose, my former employer called on me to finish their annual directory and produce one final issue of The Signal.